Join us in Morgantown, WV for a summer of STEM learning. 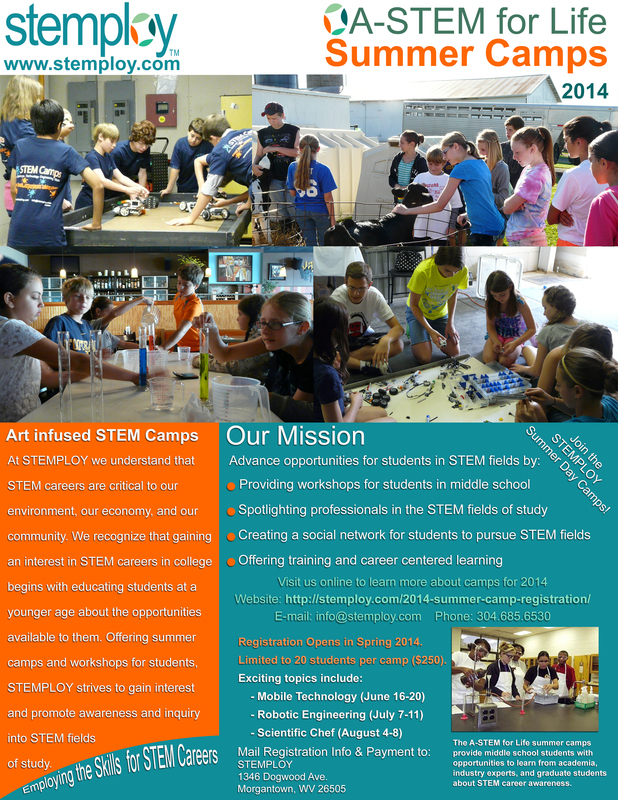 In the week-long 2014 Summer Day Camp A-STEM for Life programs (A-STEM of Mind Camp flyer), students use basic visual art and math skills to assess criteria and make recommendations for improving the efficiency or environmental impact. Students must employ scientific inquiry and explore artistic talents (hypothesis testing and investigate science behind innovative art); mobile technology (software design, programming, and mobile apps); robotic engineering (solving for a variety of unknowns, computer programming, solving robot missions); and science behind cooking (mixtures, chemical reactions, flavor enhancing). Contact STEMPLOY to find out more about each camp or complete the camp contact and medical Program Registration Packet in addition to the Registration Form to sign-up. Visit the following link for requirements on the STEMPLOY Camp Information. Fill out the form to reserve your spot now for next summer, 2014. Registration is open! Limited to 20 students per camp, so reserve your spot today! Registration: The first step in holding a spot in the 2014 camp is Registration. Please register early, as registration will close if we fill all available spots before start of camp (20 students per camp). Registration is a simple process that requires minimal information and a $50 deposit or payment in full by May 17th for $300 per week-long camp. If paying a deposit, the $50 is applied to the $300 cost. In order for STEMPLOY to keep information on file, parents are also asked to complete the registration form, camp emergency contact, and medical information in the Program Registration Packet when signing up. The following includes samples of the types of projects that LAD Studio LLC has designed, supported, and produced. Whether it’s a single design project or an integrated customized training program using a wide range of media, LAD Studio delivers smart solutions that meet your needs. We provide customer consultation for various types of programs including social media, website design, on-line learning, curriculum development, and technical documentation.